The “Return to Sleepy Hollow” event is considered a dining option, so you can only book 180 days in advance! You’ll be given the opportunity to have a Photopass photo with the Headless Horseman and his horse. It is not a backdrop, but a real character and real horse. You’ll also receive a collector’s pin and a viewing of the original 1949 Disney animated classic film “The Legend of Sleepy Hollow.” Each package offers additional options as explained below. Tri-Circle D Ranch at Fort Wilderness Resort (location check-in for movie & meet and greet) Blacksmith Shop (location of dessert party). You will be allowed to park at Fort Wilderness with this reservation! 8 p.m. show or prior to the movie if you’re viewing the later show. 8:00 PM seating dessert party arrival after the viewing 9:00 PM dessert party. Access to the Van Tassel dessert party. Reserved seating first five rows for the movie. Sleepy Halloween treats bag and logo cup. Access to watch 37 min movie. 3 years or older will receive the limited edition pin. Our photo pass person took several different shots and even used our own camera! Have rebooked this!! Was a very magical time!! Do they take just the one picture or are you allowed more than one? What is the minimum age you recommend this event for? Nevermind, I called the number above!! FYI, there are only 20 – yes, that is 20 – seats each movie showing, so 40 spots a night. The 8pm on 9/28 is already sold out. I am 180 days out today (3/29) for ADR’s during my trip which includes 9/28 but cannot find a way to make the reservation or any mention of the event on my Disney Experience app. Thanks for all the info! Do you have any details on the desserts offered? Or if they will offer DVC or AP discounts? 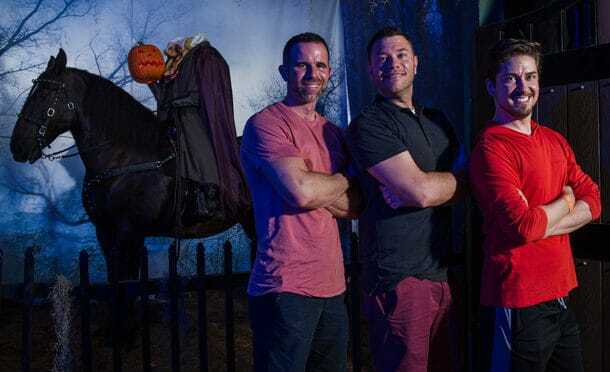 To get a photo with the Headless Horsemen character do you have to purchase one of the packages? Does it come will all the packages? Not interested in the pin or movie. Can the dining plan be used for the dessert party?